**Note: A 4.167% Hawaii sales tax will be added to your total amount. Also, there is an additional $100 fee for weddings taking place before 8am, and an additional $300 fee for weddings taking place on a holiday or on Valentine's Day, and an extra $150 charge from February 10-13, and from February 15-17 (due to increased flower cost). 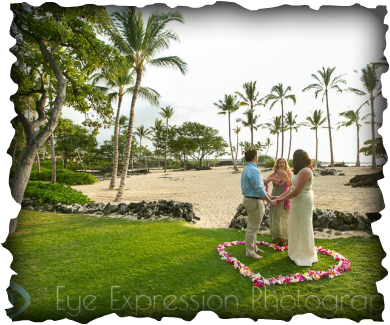 ​Check out our special Valentine's Day Elopement Packages by going HERE. and thus will be unable to accommodate any weddings during this time. 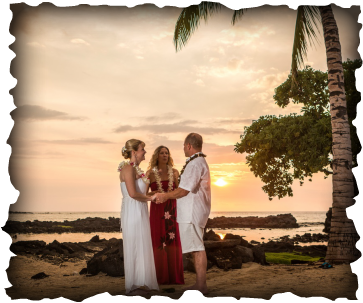 Wanting to get married the October 8-15, 2018 (even DURING the race)? Then click HERE for Special Kona Triathlon Packages! Valid only from October 8-15, 2018. *Groups of up to 10 guests can be accommodated, but note that a $50 surcharge will apply to groups with more than six guests, with a maximum of 10 guests total for this super-simple package. ​*Groups of up to 10 can be accommodated, but note that a $50 surcharge will apply to groups with more than six guests, with a maximum of 10 guests total, for this super-simple package. **Note: The $525 rate applies to elopements only (no guests); the $575 rate is the base for parties with up to 6 guests. A 4.167% Hawaii sales tax will be added to your total amount. Also, there is an additional fee for weddings taking place on a holiday, or other special weeks or days* (*see top of page for details). 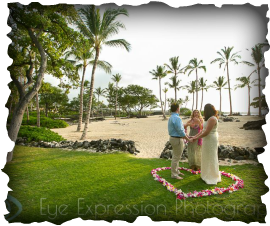 *Note: The $795 rate applies to elopements only (no guests); the $850 rate is the base for parties with up to 14 guests. A 4.167% Hawaii sales tax will be added to your total amount. Also, there is an additional fee for weddings taking place on a holiday, or other special weeks or days* (*see top of page for details). This package includes all of the most popular upgrades and options, including professional photography and a professional musician, taking the stress, coordination and decision-making out of your big day. 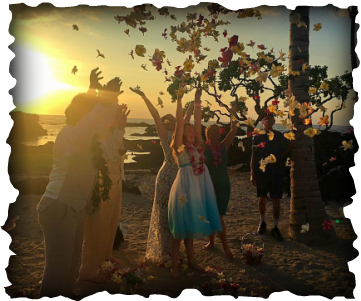 You can still add additional items (Leis for guests? A sparkling cider toast? A small symbolic wedding cake? An upgrade to a super-fancy custom bouquet?) as you desire (or not). *Note: A 4.167% Hawaii sales tax will be added to your total amount. Also, there is an additional fee for weddings taking place on a holiday, or other special weeks or days* (*see top of page for details).